The goal of the MultiFarm track is to evaluate the ability of matcher systems to deal with cross-lingual*** ontologies. It serves the purpose of evaluating the strength and weakness of matchers (by being progressive and wide coverage) and measuring the progress of matchers (by being stable and reusable over the years), with a special focus on multilingualism. The schedule is that of http://oaei.ontologymatching.org/2013/. 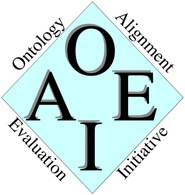 The results of the OAEI 2013, for the MultiFarm track are available here. For further information about this dataset, please refer to the dataset description page. In order to provide some blind evaluation, we do not made available the translations on edas and ekaw ontologies in the current testing data set. The [pair-language] refers to one of the 36 different language pairs: cn-en, cn-cz, cz-es, fr-pt, en-pt, cz-de, pt-ru, cn-pt, cz-ru, de-fr, de-pt, en-es, en-fr, cn-nl, de-ru, cn-de, cn-es, en-nl, cz-en, en-ru, cz-fr, es-ru, de-en, nl-ru, es-pt, de-es, fr-nl, de-nl, nl-pt, es-nl, fr-ru, cz-pt, es-fr, cn-ru, cn-fr, cz-nl. For instance, cn-cz-multifarm, for example, refers to the chinese-czech language pair. Please, refer to the instructions on how you can test your tools. Following those instructions, you have to use the MultiFarm data set identifiers indicated above. This track is organized by Cassia Trojahn dos Santos. If you have any problems working with the ontologies, any questions or suggestions, feel free to write an email to cassia [.] trojahn [at] irit [.] fr. NOTE : We have revised the definitions of multilingual and cross-lingual terms. Contrary to what is reported in MultiFarm paper, MultiFarm is a benchmark for cross-lingual ontology matching.